25mm Blue, yellow and white I blame Boris badge. 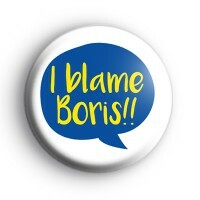 This Pro EU themed badge lets everyone know that you blame Boris Johnson for the Brexit fiasco! That you lay the blame firmly at his door, all the lies he told the British people. Our EU badges have been really popular since the European Union referendum in the UK & subsequent Brexit negotiations, we have lots of Pro Europe/Anti Brexit badges in the shop, so be sure to take a look at those before checking out.